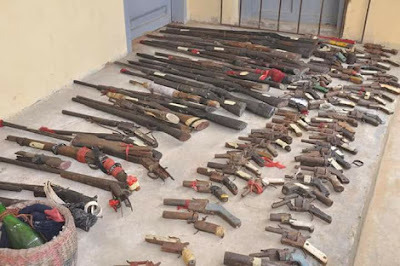 Over 100 cultists belonging to various groups in Etim Ekpo and Ukanafun local government areas of Akwa Ibom state, have surrendered their arms following the state government’s move towards granting amnesty to the hoodlums who have been terrorizing the council areas. They openly renounced their membership of the cults. 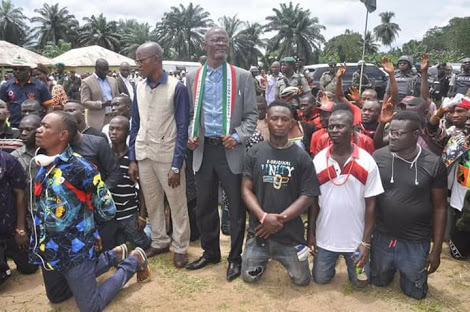 reconciliation and rehabilitation visit to the local government areas on Tuesday, said that this was the fourth time the Governor visited the areas for a peace-seeking mission. Ogunjemilusi appreciated the governor’s amnesty to the repentant cultists despite the various atrocities committed by them. The hoodlums are Mentor Monday, Tendom Jonah, Stainless, Enebong Sunday Akpan, Ubong Mark alias Small poo, Gospel Long John (Jimnas), Saviour Oketeh (Point & Kill), Goodluck Innocent Monday (Small DPO), Kufre Joshua (Lagos Boy), Kingsley Silas (Wise Man) and many others.